It is pure coincidence, but I happened to have been preparing to review the claire's 6 pack pastel mini nail polish set, when I discovered the new Etude House Sugar Powder Play Nails nail polishes - also in bright pastel colors. I cannot buy those nail polishes just yet, so for now, I will just have to settle with these mini nail polishes. 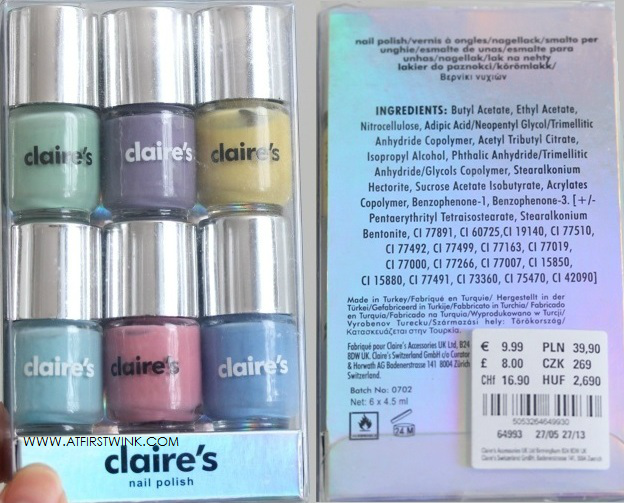 I bought the claire's 6 pack pastel mini nail polish set - multi coloured pastels last year already, but I haven't been able to swatch these sooner. I have many other Spring 2013 nail polishes lined up, so you will finally see them on my blog too. This nail polish set contains 6 cute, little bottles with 4.5 ml of content. You might think that they would be hard to hold on to due to their small size, but on the contrary, the cap is exactly large enough to put pressure on it with your thumb and index finger. The brush is also the size that I prefer. It is the narrow, round kind that becomes slightly wider at the end. Unlike what I am used to, these nail polishes apply the best, when you take a generous amount out of the bottle at once. The first layer might scare you off due to the extreme streakiness, but after 2-3 layers, you get a very glossy, gel nail like result. For that, you need to continue to apply a lot of nail polish with every stroke (thin layers look very bad >_<) and wait a long time for each layer to dry. The sky blue nail polish is exactly the color that I wanted to get. In the past, I have bought a similar color of nail polish and the streakiness made me not want to wear it again, after the first try. But this one is different, as it applies very smoothly and the glossy formula doesn't make it look like correction fluid. Sadly, the color becomes a shade darker after a day, but it still looks very nice. 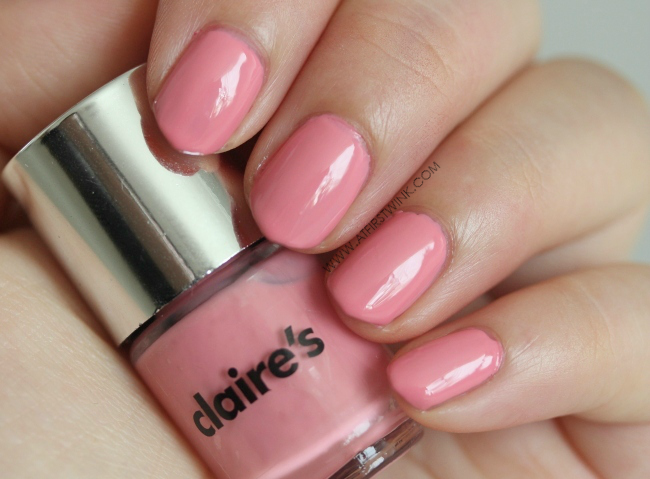 The pink nail polish has a very fun, bubble gum pink color that I don't have in my collection yet. The purple nail polish has a very elegant purple color that looks very similar to the Etude House nail polish DPP504 - Bye Violet that I also have. The yellow nail polish has a very bright yellow color that is the perfect Easter nails color. It looks very similar to the Modi Juicy Nails nail polish no. 17 - Banana Shake. Lastly, we have the dark blue nail polish that was quite hard to capture. It has a darker blue color than in the picture, very identical to the HEMA Long Lasting nail polish no. 834 - Han Blue. Here, you can see all the colors again on a nail wheel. Although I needed to apply many layers of nail polish to get opaque nails, the formula wasn't that hard to deal with. It layered quite nicely - when you apply thick layers - and the formula wasn't too watery -so even when you apply thick layers, it didn't turn into a mess. With that many layers, I was also surprised that it didn't feel heavy on the nails at all. Even though you need to apply a lot each time and the bottles are really small, it looks like I could paint my nails 4-5 times with each bottle. I am a bit ashamed to say it, but that it is about the amount that I have worn the full-size nail polishes that I own. I wish more companies would make smaller bottles, so that I could try out more different colors and glitters without worrying that I am just leaving them to dry out. I am also having no space to store them anymore. How I wish I could use up more so that I can throw some away (to get more space for new ones ^_^). I really like these very glossy and pretty candy colors. For pastel nail polish colors, they are a bit on the darker side, but these colors are more flattering than the ones with a white base tone. I did notice some differences between the nail polishes of this set. The lightest colors (yellow and pink) were still somewhat streaky after 2-3 layers, but the purple color was already opaque with just 1-2 layers. Some of the colors also stained my nails (I think it was the light blue and the green? ), so make sure to apply a good base coat. This is the first time, I tried nail polishes from claire's, which isn't really a beauty or nail polish brand, so I am quite satisfied with the results. I sort of expected a strong nail polish scent, but the scent was very subtle and easy to my sensitive nose. Because of this, I might buy some more nail polishes from them to try out.